If you’ve got a Mac then you also have the option of using the Apple Remote. 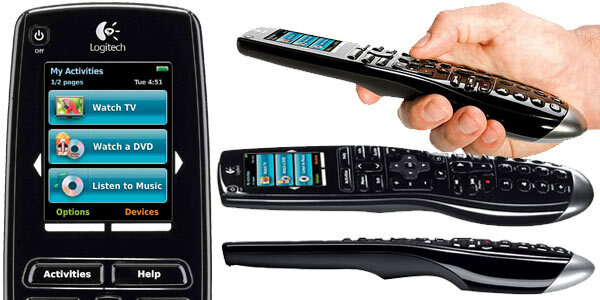 If you want to splash out a bit you can look at the Logitech Harmony One Universal remote control which can replace pretty much every other remote that you have. Personally I have yet to be able to justify the high price tag to myself so it’s on the wish list for the foreseeable future. If you plan on getting a good wireless keyboard and you’re happy to have that floating around your couch all the time then you’ll probably be able to survive without a remote. If you have an iPod Touch or an iPhone there are some awesome apps that allows you to turn it into a remote control for your HTPC and does it much more elegantly than a standard remote control. would songs on your iPod including access to poster artwork and meta-data. 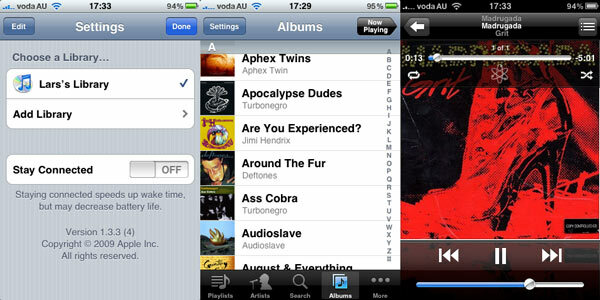 This is an app made by Apple and allows your iPhone or iPod touch to act as a remote control for your iTunes library. It gives you access to your full iTunes library just as if you were browsing musing on your iPod. You can also play, pause, fast forward and control the volume of the computer running iTunes. It’s a free app by Apple and works on both PC and Mac. It is extremely easy to setup and you’ll be up and running in less than five minutes. It’s great for parties where you can control music from your phone and let other people select songs without the need for people to access the computer. If you’ve got a Mac and are planning on running Plex there’s an app for that too. Most of the time you’ll get away with just using a remote for controlling an HTPC but there are times when a keyboard is needed. You might just want to browse the net on your TV, play a game or just install or run a few applications in which case you’ll want a wireless keyboard attached to your HTPC. When it comes to wireless keyboards it mostly comes down to aethetics again, since this thing is going to be in your living room you don’t want an ugly square or god forbid beige keyboard floating about. The price varies significantly from less than $50 to more than $300. Generally speaking the more expensive keyboards tend to look better and generally have a better build quality, perhaps some more features and if you’re lucky improved battery life. Overall looks – since this will be in your living room, make sure it fits in and isn’t too heavy or ugly. This is of course a subjective matter and some people won’t really care what it looks like. Bluetooth – try to get a keyboard with Bluetooth support as the distances in the living room are going to be greater than at your desk. Touchpad – if possible get a keyboard with a touchpad or some other way of controlling the mouse, this allows you to do everything with the keyboard and elimiantes the need for a mouse. Trying to find a surface to use the mouse on in the couch can be very annoying. Media controls – A lot of wireless keyboards come with additional buttons and controls specifically aimed at media, like volume control, play, pause, fast forward etc. for an HTPC keyboard these controls are extremely handy. Battery life – This is not as important for an HTPC keyboard as it is for a desktop one as you’ll be using it less frequently but nevertheless it’s nice to have. Just don’t pay too much more for it. Noise – Avoid getting a keyboard with loud tapping sounds when you use it. Not all manufacturers list info on this so if you can test out some keyboards at your local computer store before you buy. 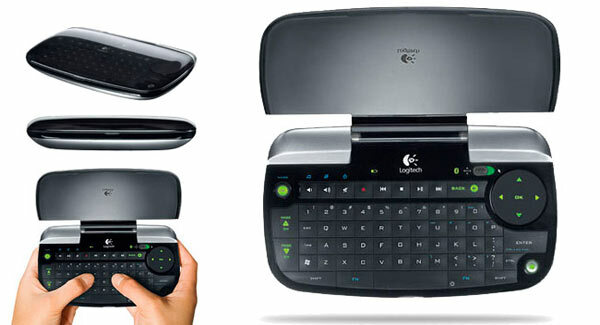 I’ve got my eyes on the Logitech DiNovo Mini Bluetooth keyboard. I was a bit hestitant at first due to it’s small size but after some consideration I came to the conclusion that I didn’t really want a full sized keyboard the size of a small laptop floating around on the couch. The DiNovo is the size of a big remote control and would allow me to do all the tasks I’d need to on an HTPC without getting in the way when I don’t need it. The side mouse panel eliminates the need for a mouse, at least for the vast majority of tasks I’d need to perform on an HTPC. It’s also handy to double as a pseudo game controller when playing games. Time will tell if I can effectively play games on the DiNovo Mini but if I can’t then there’s always the option of having a secondary full sized wireless keyboard that is only used for gaming. is in my opinion one of the most aesthetically pleasing ones. It is also one of the more expesive ones on the market. If your HTPC doesn’t have a lot of storage capacity or room to expand with more hard-drives chances are you’ll want to expand your storage capacity farily soon. A NAS is a great way of doing this, they come in a variety of different shapes sizes and price tags. A NAS or Network Attached Storage is basically a box with one or more hard-drives a very basic embedded OS and a network connection that allows it to act as a file server. Most NAS units aimed at consumers have room for 2-4 drives and cost around $300-800. If you want to go all out you could get a 4, 6 or 8 drive NAS noromally aimed at small businesses. The more advanced NAS units not only have more drive slots but often support hot-swappable drives or at the very least an easy way for you to add or replace drives. The cool thing about these NAS units is that you can choose the hard-drives that you want yourself. If there are only 2 drive bays then you don’t have to settle for the embedded 2x1TB drives but instead install 2×1.5TB or even 2x2TB for twice the storage from the same box. You can also buy a diskless NAS and a single HD then gradually expand it with additional drives as you need more space. If you’re on a budget then a portable USB hard-drive or three hooked up to your HTPC will also do the trick. There are plenty of options for controlling your HTPC and alot of it comes down to personal preference. If you’ve got an iPhone then you can might choose to skip getting a remote and just have a Wireless keyboard as a backup. You might want to get rid of all your existing remotes and get on Universal remote to rule them all including your new HTPC. I could go on talking about additional peripherals and sound systems but that’s whole different bag of chips and beyond the scope of this article. Hopefully you’ll have some ideas of what’s possible and what’s available. I am surprised the xbmc android app is not mentioned. It’s definitely an option if you’re using Andriod. I don’t recall if was available at the time of writing. There’s been quite a few updates since then. The XBMC commander iPad app is also pretty cool. You can even run XBMC on a Jailbroken iPad if you want. Right now I’d also probably recommend using the Drobo FS over a NAS.